Here’s a slice of life in Montreal. 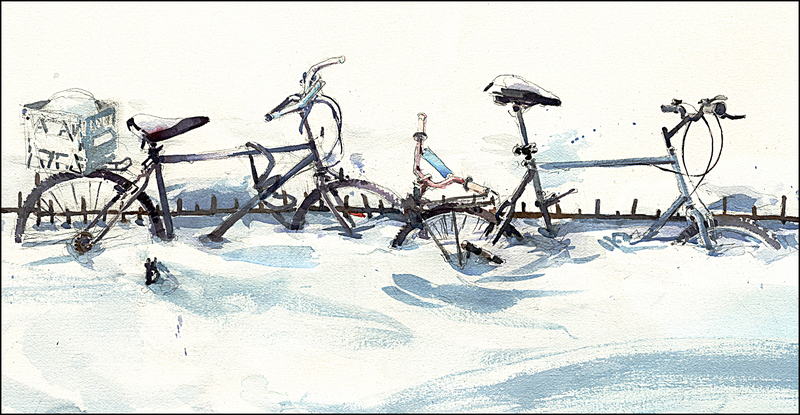 The mournful sight of bikes rusting away in the snowbank. There’s lots of reasons to bike in Montreal. The bike lanes pretty much go everywhere, and there’s nowhere to park a car anyway. Plus it’s greener, and saves money. So lots of people bike. Some ride all winter. Snow and sleet be dammed. Here on the Plateau, people live in these 100 year old buildings with precarious external staircases. There’s no place in your tiny apartment for a bike even if you didn’t fall to your death trying to take it upstairs. And your tires are full of salty/gravelly/slush. Probably why you’re always seeing them on the sidewalk locked to a little iron railing, axle deep in the snowbank. After the melt the streets are littered with these frozen bike-corpses chained to posts. Many have been crippled by the snow plows crushing their wheels into pretzels. It’s like the Russian front for bikes. Dead soldiers frozen into the ground. If you’re a bike, you do not want to get sent to Montreal for the winter. Nice drawing :). I did’nt know that bikes were so often used in Montreal… even in winter. Thanks for sharing !